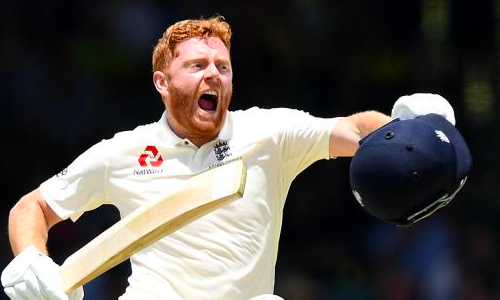 Sri Lanka needed an extra fielder on Day 1 of the third Test match in Colombo against England as Jonny Bairstow and Ben Stokes tormented the host bowlers. During the 64th over of England’s first innings, Bairstow (98*) and Stokes (53*) were at the crease, when a stray dog intruded the ground, disrupting play for a while. Nonetheless, the stop in play turned out to be beneficial for Sri Lanka, who managed to break the partnership soon after, with Lakshan Sandakan getting rid of Stokes (57). Bairstow (110) went on to complete his century but couldn’t carry on for long as he failed to read a Sandakan delivery that went on to crash on to the stumps. The visitors put on a total of 336 runs. Sri Lanka, reply, were 74-1 at the end of first session on Day 2. England have already take a 2-0 series lead. This is not the first time a dog has halted proceedings of a cricket match. A similar incident had happened during an India-England match in Visakhapatnam a couple of years back. ???? DOG STOPS PLAY ???? A stray dog is trying to help out Sri Lanka in the field as they struggle to contain England.